Thanks to Steve Pulley we have a biography of Bolivia’s first Native Baha’i. Declared in 1956 in La Paz. Bolivia, which has the largest native population in all of the Americas (in a country of 10 million, a full Amerindian population of 55% and 30% mestizo) is renown for the vast numbers of Quechua and Aymara peoples who have embraced the Faith. The overwhelming majority of Bolivia's 350,000 Baha'is are Native Quechuans and Aymarans, descendants of the ancient Inca civilization. 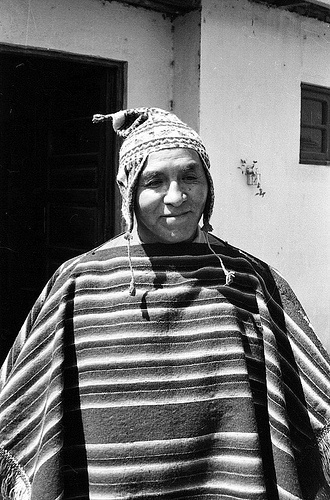 The first Native Baha'i of Bolivia was Andrés Jachakollo (aka Cerrogrande, which means "Great Mountain" in Aymara [Jach'a Kollo or Jach'a Qullu, depending on the phonetic system used]), who declared his faith in 1956 in the capital city of La Paz. At the time, he was an important member of an indigenous movement of search and liberation known as "Los Espíritus" and led by Toribio Miranda during the 1940s and '50s, when he found the Baha'i Faith. Andrés Jachakollo came across the Faith quite by "accident" while walking down a street in La Paz, Bolivia. He saw a sign next to a door that said "Fe Mundial Baha'i" (Baha'i World Faith), and it immediately caught his attention. He knocked on the door, and a most elegant woman answered. Her name was Yvonne Cuellar, and as it turned out, she was the first declared Baha'i of Bolivia! She was French-born, but had married a Bolivian Army officer. In the 1940s they had an American boarder, who just so happened to be the first Baha'i pioneer to Bolivia, who taught Mrs. Cuellar the Faith. Both she and her husband became Baha'is and helped establish the first Baha'i community of La Paz. He later became one of Bolivia's most intrepid and influential Baha'i travel teachers, was elected to Bolivia's first National Spiritual Assembly in 1961, and later served for many years as an Auxiliary Board member. He was also one of the founding members of FUNDESIB (Foundation for the Integral Development of Bolivia), the foundation that created Nur University. It is said that he brought more than 5,000 souls into the Faith during his life, many of these who later on became great Baha'i teachers, administrators, and spiritual inspirations in their own right.